JFW has checked-in at Baselworld 2017. With only one day under our belts, we’re already overwhelmed by the display. 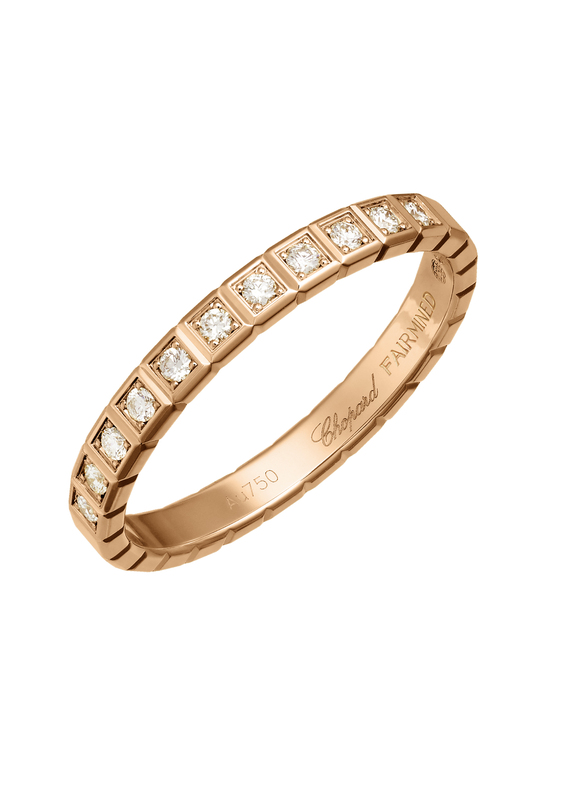 Of course one of the highlights this year – and honestly every year – are the novelties at Chopard. First off, here’s a term for you: Sustainable Luxury. 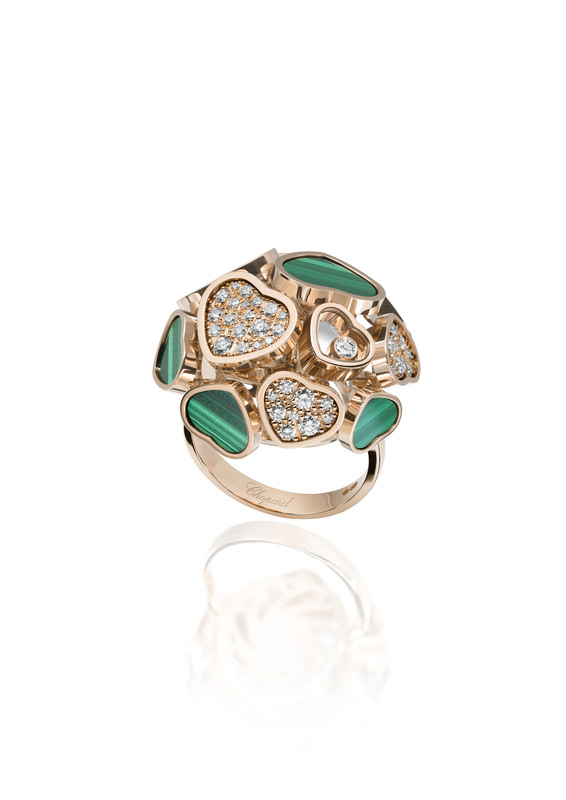 It was coined only a few years ago and since then Chopard has introduced several covetable pieces in its ‘Green Carpet Collection’ showcasing responsibly mined gold and emeralds. Beyond that, the House is collaborating with sustainable brand consultancy Eco-Age (its creative director is Livia Firth) to promote ethics in the world of fashion and has demonstrated its commitment to ethical sourcing throughout several collections. 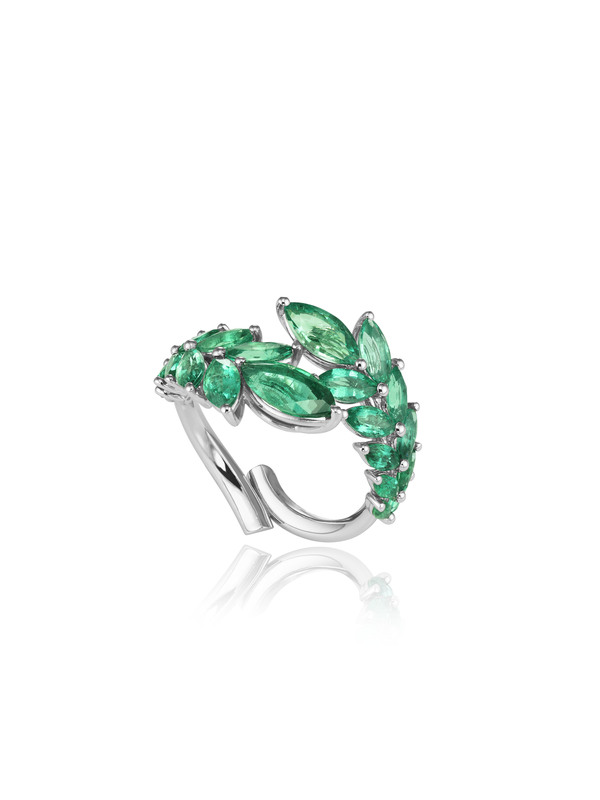 So all jewellery and watches from the ‘Green Carpet Collection’ are certified ‘fairmined’ gold, all emeralds are responsibly mined at Gemfields’ Kagem mine in Zambia and all diamonds are sourced from a producer who is a RJC certified member. 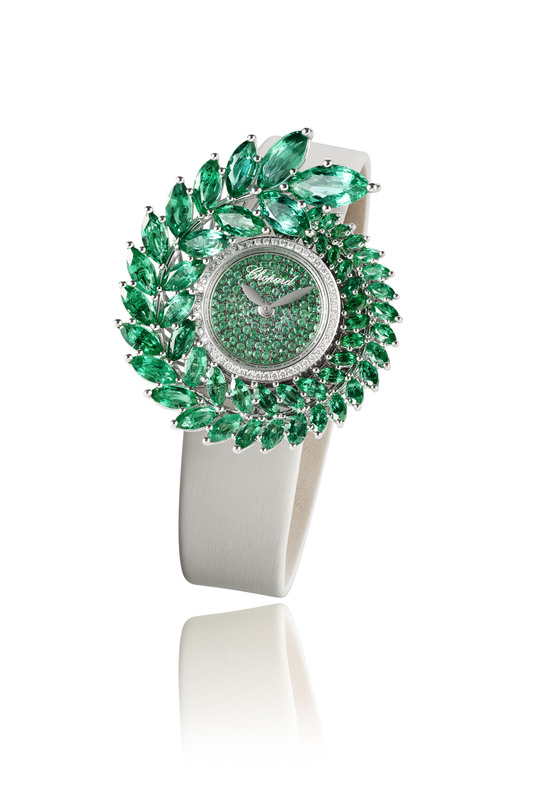 Chopard Green Carpet timepiece in white ethical gold with marquise-cut emeralds and brilliant-cut emeralds. Quartz movement on a white satin bracelet. Now what’s cooler than an ice cube? Nothing. 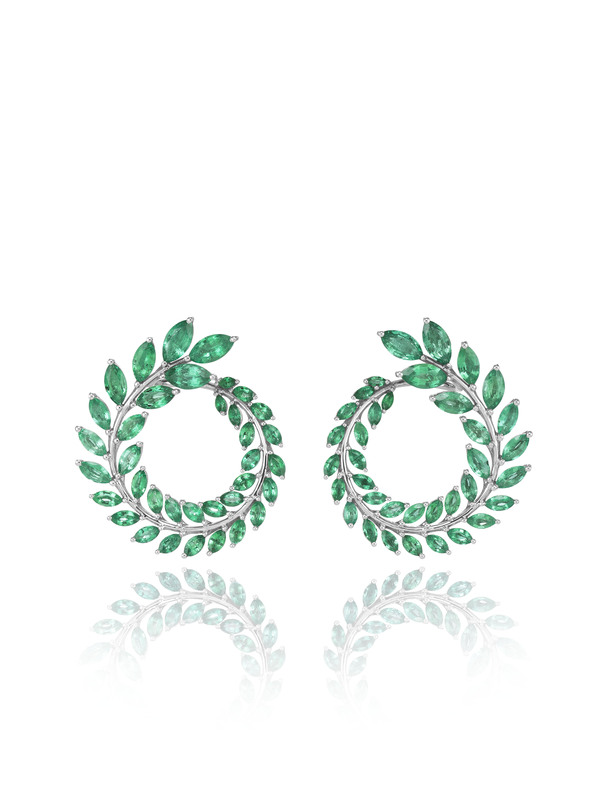 Which is why Chopard has an avant-garde collection of trendy jewels named after them. 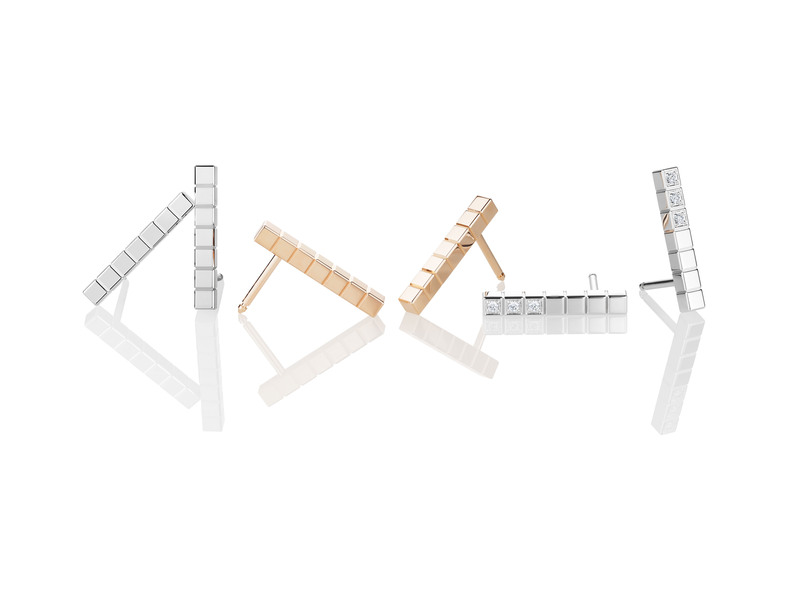 Ice Cube Pure contains watches, necklaces, rings and bracelets featuring small cubes – polished or diamond-set – lined up in tightly packed rows, in a wondrous combination of ethical yellow, white and rose gold. 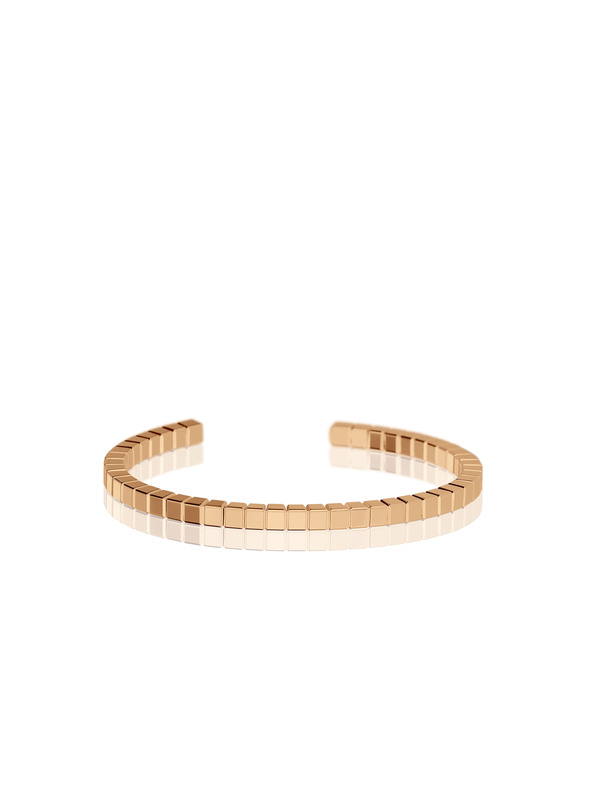 Solitary or stacked, simply stunning. 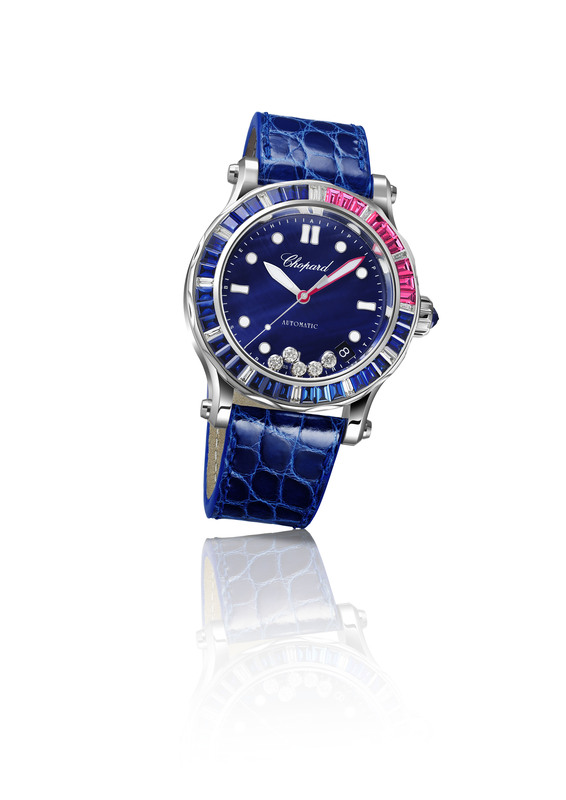 Each year since 2014, Chopard has introduced an L.U.C XP watch for women, and this year is no exception. The L.U.C XP Esprit de Fleurier Peony is a direct descendant of the L.U.C XPS 35mm Esprit de Fleurier and the L.U.C XP 35mm Esprit de Fleurier Peony presented in 2015 and 2016. 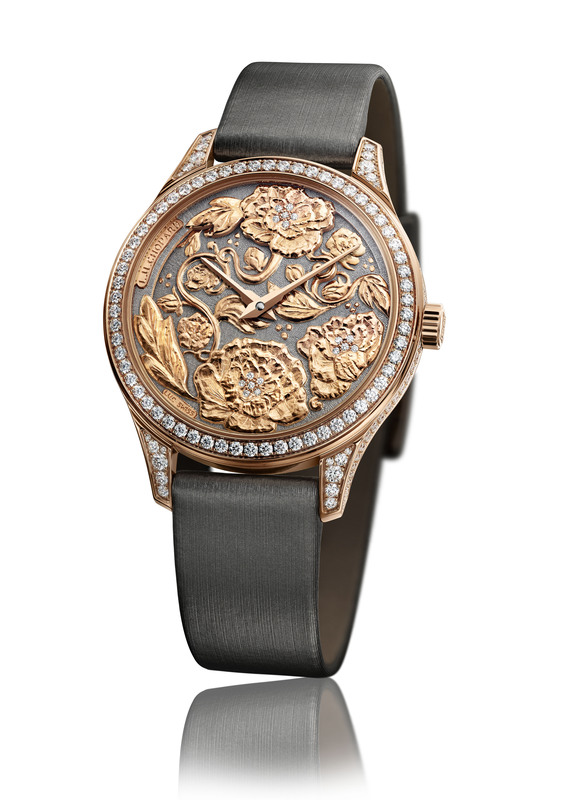 It echoes the design codes of both models, adopting their light, curvaceous lines, featuring intricate Fleurisanne engraving, and showcasing majestic blooms that adorn both the face and heart of the timepiece. 35 mm rose gold watch L.U.C 96.23-L Fleurisanne engraved. Automatic movement, 65-hour power reserve, 2 barrels. Twin technology hour, minute. White and rose gold fleurisanne engraved dial. 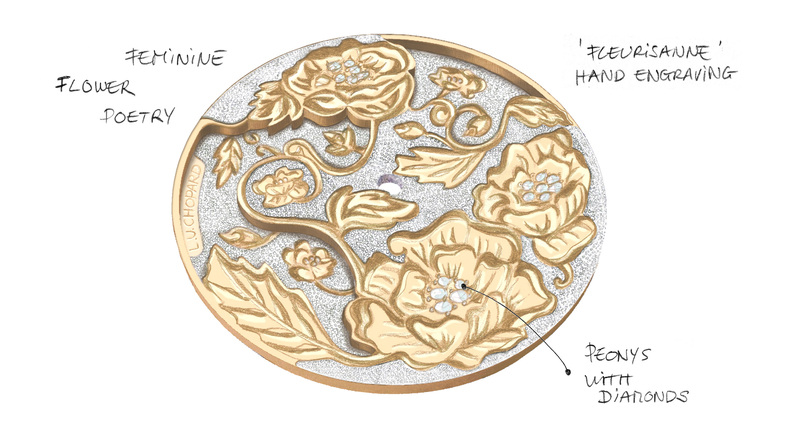 Peony motif with diamond-set pistil. Open case-back, water resistant to 30 meters. Brushed grey canvas strap. 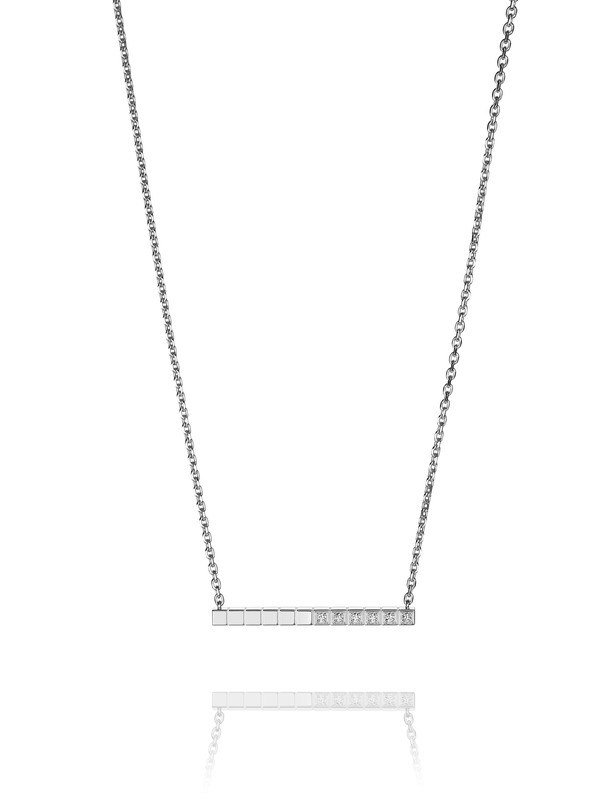 8 Pieces limited edition. 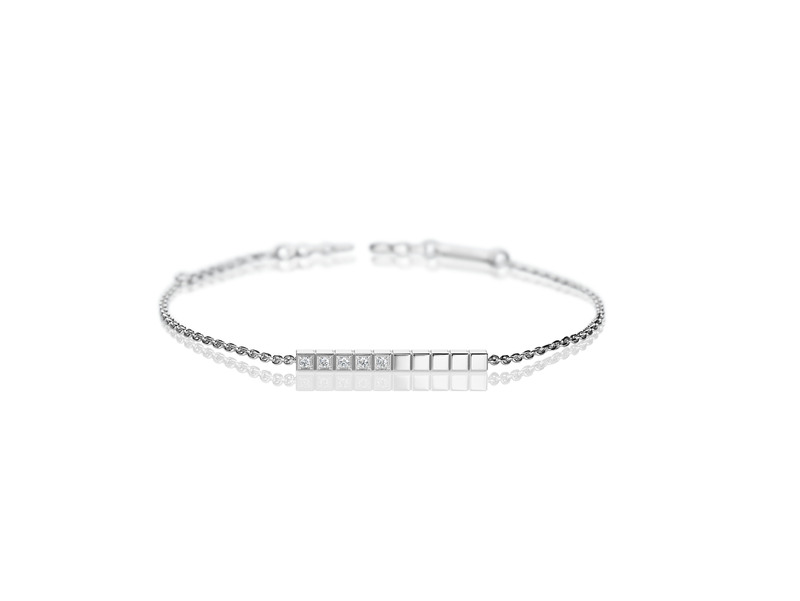 And finally it’s no surprise that Chopard gets ‘Happy’. 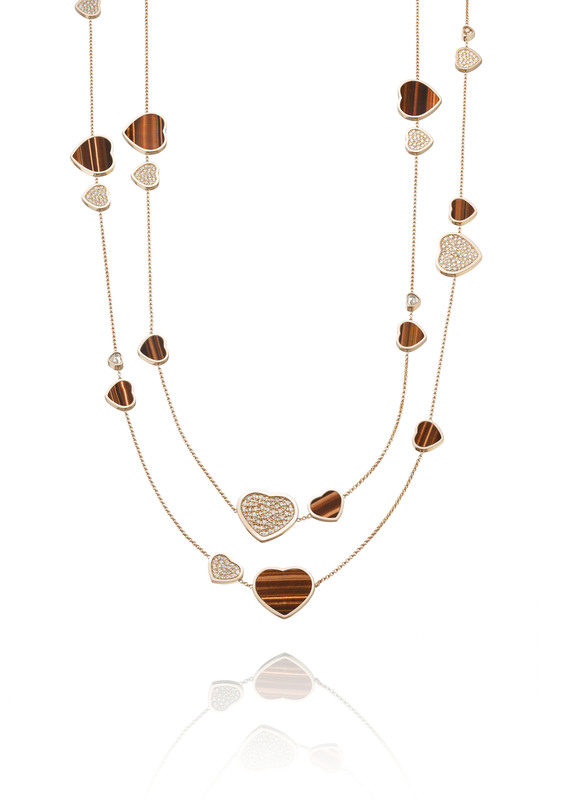 Its Happy Hearts and Happy Ocean collection are nothing less than whimsical. 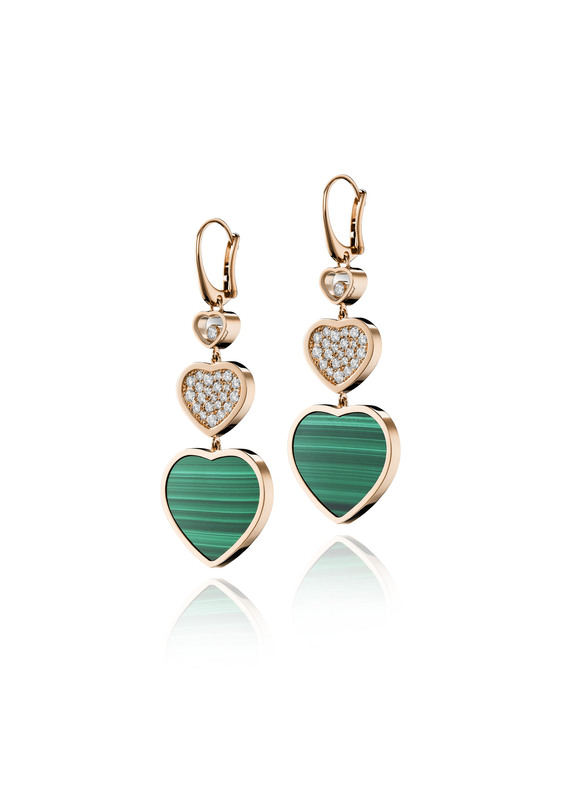 The heart is a key symbol of Chopard and now takes a starring role in two versions: diamonds and malachite or diamonds and tiger eye. The sporty yet elegant Happy Ocean watch, on the other hand, marries ice and steel, with diamonds frolicking between two sapphire crystals, illuminating the entire dial. Now tell us, who wouldn’t be happy to wear these? 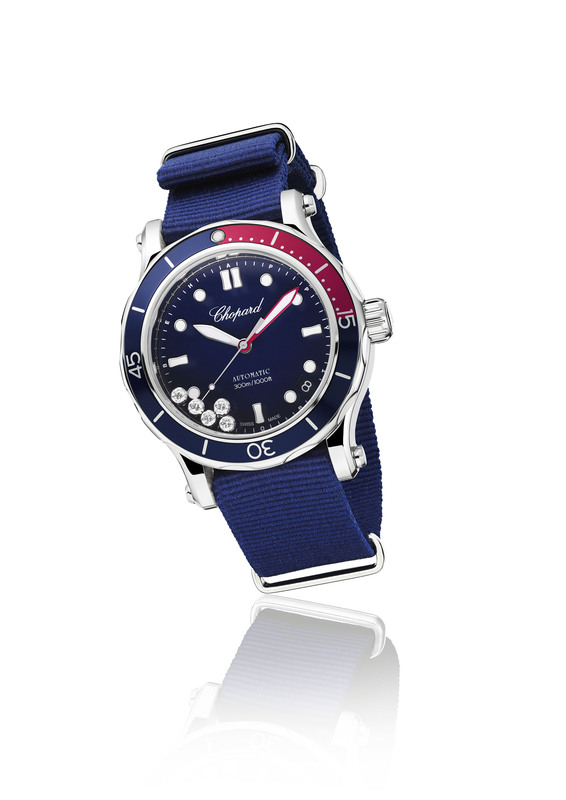 Chopard, Happy Ocean. White gold watch, Chopard 01.01-C Automatic movement, 60 hour power reserve. Bezel set with baguette-cut sapphires, diamonds and rubies or blue topazes. Navy blue mother-of-pearl dial, five mobile diamonds. Water resistant to 100 meters. Navy blue alligator strap. 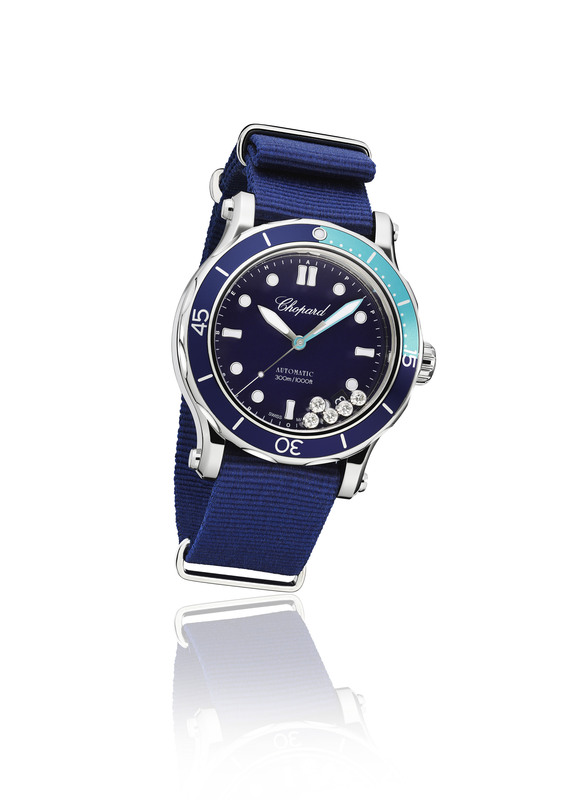 Chopard, Happy Ocean. 40 mm stainless steel watch, Chopard 01.01-C Automatic movement, 60-hour power reserve. Hour, minute, second date at 4.30. Rotating bezel with an anodised aluminium insert and dot filled with white sun emitting green luminescence. Raspberry-rimmed minutes. Navy blue dial, five mobile diamonds. Water resistant to 300 meters.